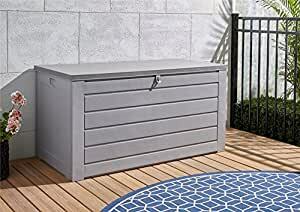 COSCO Outdoor Living now features an 180 gallon, extra large outdoor storage box. The spacious interior dimension of 54.5″ W x 25.5″ D x 27.5″ H will fit your cushions, pool supplies, gardening supplies, or many other outdoor items. The lid is designed for a lock (sold separately). The closing mechanism for the hinges can be adjusted for a varied lid closing speed. COSCO Outdoor Living, a brand of COSCO ProductsÂ®, offers space saving folding groups to roomy conversation and dining sets, designed to meet all your outdoor patio needs. Our collections help create your own outdoor lounging spaces or cozy living areas on your patio or deck. Our outdoor products are designed with form and function in mind to help you create the outdoor space you dream of. Design aspects for COSCO Outdoor Living products include innovation, style, and elegance to suit any customerâs home dÃ©cor or design motif. Manufactured with durable, weather-resistant materials, our furniture is built to last and to impress. We offer different color options on multiple sets, making it easy to fit your personal taste. We invite you to sit back, relax and enjoy your COSCO Outdoor Living furniture.